Development for a second adaptation of Charlie and the Chocolate Factory (filmed previously as Willy Wonka & the Chocolate Factory in 1971) began in 1991, which resulted in Warner Bros. providing the Dahl Estate with total artistic control. Prior to Burton's involvement, directors such as Gary Ross, Rob Minkoff, Martin Scorsese and Tom Shadyac had been involved, while actors Bill Murray, Nicolas Cage, Jim Carrey, Michael Keaton, Brad Pitt, Will Smith, Adam Sandler, and many others, were either in discussion with or considered by the studio to play Wonka. Burton immediately brought regular collaborators Depp and Danny Elfman aboard. Charlie and the Chocolate Factory represents the first time since The Nightmare Before Christmas that Elfman contributed to a film score using written songs and his vocals. Filming took place from June to December 2004 at Pinewood Studios in the United Kingdom. Charlie and the Chocolate Factory was released to positive critical reception and was a box office success, grossing $475 million worldwide. Charlie Bucket is a poor boy who lives near the Wonka Candy Company. The company's owner, Willy Wonka, has for long closed access to his factory due to problems concerning industrial espionage that led him to fire all his employees, among them Charlie's Grandpa Joe. One day, Wonka announces a contest, in which Golden Tickets have been placed in five random Wonka Bars worldwide, and the winners will be given a full tour of the factory as well as a lifetime supply of chocolate, while one ticketholder will be given a special prize at the end of the tour. Wonka's sales subsequently skyrocket, and the first four tickets are found fairly quickly. The recipients are Augustus Gloop, a gluttonous German boy; Veruca Salt, a very spoiled English girl; Violet Beauregarde, an arrogant gum chewer, and Mike Teavee, an ill-tempered television and video game addict. Charlie tries twice to find a ticket, but both bars come up empty. After overhearing that the final ticket was found in Russia, Charlie finds a ten-dollar note, and purchases a Wonka Bar at a news shop. At the exact moment it was revealed that the Russian ticket was forged, Charlie discovers the real fifth ticket inside the wrapper. Charlie receives monetary offers for the ticket, but decides to keep it and bring Grandpa Joe to accompany him on the factory tour. Charlie and the other ticket holders are greeted by Wonka outside the factory, who then leads them into the facility. Individual character flaws cause four children to give into temptation and the Oompa-Loompas sing a song of morality after each elimination. During the tour, flashbacks reveal Wonka's troubled past; his father, a prominent dentist named Wilbur, strictly forbade Wonka from consuming candy due to the potential risk to his teeth. After sneaking over a piece of candy, Wonka was instantly hooked, and ran away to follow his dreams. When he returned, both his father and their house were gone. After the tour, the four children leave the factory with an exaggerated characteristic or deformity related to their demise, while Charlie learns Wonka intended to find a worthy heir to his factory. Since Charlie was the "least rotten" of the five, Wonka invites Charlie to come live and work in the factory with him, but Charlie declines as his family is the most important thing in his life. Charlie and his family are living contently a while later; however, Wonka is too depressed to make candy the way he used to, causing his candy to sell poorly and his company to decline. He turns to Charlie for advice. Charlie decides to help Wonka confront and reconcile with his estranged father; Wonka finally realizes the value of family, while his father learns to accept his son for who he is, and not what he does. In the end, Wonka finally allows Charlie's family to move into the factory. Scott Frank was hired to write the screenplay in February 1999, after approaching Warner Bros. for the job. Frank, a recent Oscar-nominee for the R-rated crime film Out of Sight, wanted to work on a film that his children could enjoy. As an enthusiastic fan of the book, he intended to remain more faithful to Dahl's vision than the 1971 film had been. Nicolas Cage was under discussions for Willy Wonka, but lost interest. Gary Ross signed to direct in February 2000, which resulted in Frank completing two drafts of the screenplay, before leaving with Ross in September 2001. Both Warner Bros. and the Dahl Estate wanted Frank to stay on the project, but he faced scheduling conflicts and contractual obligations with Minority Report (2002) and The Lookout (2007). Prior to Burton's involvement, Warner Bros. considered or discussed Willy Wonka with Bill Murray, Christopher Walken, Steve Martin, Robin Williams, Nicolas Cage, Jim Carrey, Michael Keaton, Robert De Niro, Brad Pitt, Will Smith, Mike Myers, Ben Stiller, Leslie Nielsen, John Cleese, Eric Idle, Michael Palin, Patrick Stewart, and Adam Sandler. Dustin Hoffman and Marilyn Manson reportedly wanted the role as well. 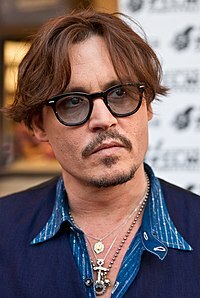 Pitt's production company, Plan B Entertainment, however, stayed on to co-finance the film with Warner Bros. Johnny Depp was the only actor Burton considered for the role, although Dwayne Johnson was Burton's second choice in case Depp was unavailable. Depp signed on without reading the script under the intention of going with a completely different approach than what Gene Wilder did in the 1971 film adaptation. Depp said regardless of the original film, Gene Wilder's characterization of Willy Wonka stood out as a unique portrayal. Depp and Burton derived their Willy Wonka from children's television show hosts such as Bob Keeshan (Captain Kangaroo), Fred Rogers, and Al Lewis from The Uncle Al Show, and Depp also took inspiration from various game show hosts. Burton recalled from his childhood that the characters were bizarre but left lasting impressions. He said, "It was kind of a strange amalgamation of these weird children's TV show hosts." Depp based Wonka's look (exaggerated bob cut and sunglasses) on Vogue magazine editor Anna Wintour. Comparisons were drawn between Willy Wonka and Michael Jackson. Burton disagreed with the comparisons and said Jackson, unlike Wonka, liked children. Depp said the similarities with Jackson never occurred to him. Instead, he compared Wonka to Howard Hughes due to his "reclusive, germaphobe, controlling" nature. Burton agreed with the similarity to Hughes. He also cited Charles Foster Kane from Citizen Kane as an inspiration for Wonka, as Kane is "somebody who was brilliant but then was traumatized and then retreats into their own world". Depp wanted to sport prosthetic makeup for the part and have a long, elongated nose, but Burton believed it would be too outrageous. During production, Gene Wilder, in an interview with The Daily Telegraph, accused the filmmakers of only remaking the 1971 film for the purpose of money. Depp said he was disappointed by Wilder's comment, and responded that the film was not a remake, but a new adaptation of Dahl's 1964 book. Review aggregator Rotten Tomatoes gives the film an approval rating of 82% based on 227 reviews, with an average rating of 7.17/10. The website's critical consensus reads, "Closer to the source material than 1971's Willy Wonka & the Chocolate Factory, Charlie and the Chocolate Factory is for people who like their Chocolate visually appealing and dark." On Metacritic the film has a weighted average score of 72 out of 100, based on 40 critics, indicating "generally favorable reviews". Audiences polled by CinemaScore gave the film an average grade of "A–" on an A+ to F scale. ^ "CHARLIE AND THE CHOCOLATE FACTORY (PG)". British Board of Film Classification. June 23, 2005. Retrieved August 9, 2015. ^ "LUMIERE : Film: Charlie and the Chocolate Factory". ^ a b c d Chris Nashawaty (July 8, 2005). "Cover Story: The Truth About 'Charlie'". Entertainment Weekly. Retrieved June 11, 2009. ^ "Charlie and the Chocolate Factory (2005)". Box Office Mojo. Amazon.com. Retrieved April 12, 2011. ^ a b c d Rob Waugh (April 3, 2005). "Sweet Smell of Success". The Mail on Sunday. Archived from the original on June 12, 2018. Retrieved July 12, 2009 – via HighBeam Research. ^ a b c Michael Fleming (May 21, 2003). "Warners takes whack at 'Wonka'". Variety. Retrieved June 10, 2009. ^ a b c d e f g h i j k John Horn (July 12, 2005). "A Nuttier 'Chocolate'". Los Angeles Times. Retrieved June 16, 2009. ^ a b c Benedict Carver (February 4, 1999). "WB to taste 'Chocolate'". Variety. Retrieved June 10, 2009. ^ "Complete List of Nominees". Washington Post. Retrieved August 30, 2014. ^ Roger Ebert (June 19, 1998). "Out of Sight". rogerebert.com. Retrieved August 30, 2014. ^ a b c Steve Head (September 15, 2001). "Scott Frank's Adventures with Charlie and the Chocolate Factory". IGN. Retrieved June 12, 2009. ^ a b c d Greg Dean Schmitz. "Greg's Preview — Charlie and the Chocolate Factory". Yahoo! Movies. Archived from the original on April 15, 2007. Retrieved July 18, 2009. ^ a b Michael Fleming (February 22, 2000). "Siegel ankles B-G, forms own banner". Variety. Retrieved June 10, 2009. ^ Steve Head (September 6, 2001). "Ross and Frank Bid Adieu to Wonka Remake". IGN. Retrieved June 12, 2009. ^ Steve Head (October 16, 2001). "Chocolate Factory Gets New CEO, Rob Minkoff". IGN. Retrieved June 12, 2009. ^ Dana Harris (February 27, 2002). "Lurie back to book for 'Chocolate' pic". Variety. Retrieved June 10, 2009. ^ a b c d e f g h i j k l m n o Mark Salisbury; Tim Burton (2006). "Charlie and the Chocolate Factory". Burton on Burton. London: Faber and Faber. pp. 223–245. ISBN 0-571-22926-3. ^ Michael Fleming (August 19, 2003). "Where there's a Willy". Variety. Retrieved June 10, 2009. ^ "Did I ever watch the original Charlie and the Chocolate Factory?". John August.com. June 7, 2004. Archived from the original on January 4, 2010. Retrieved July 20, 2009. ^ Jon Burlingame (July 10, 2005). "Sing Along With Roald". The New York Times. ^ a b c Steve Head (July 8, 2005). "Interview: Tim Burton". IGN. Retrieved June 12, 2009. ^ a b Stacy (July 31, 2009). "Movie Trivia: Charlie and the Chocolate Factory". Retrieved June 19, 2015. ^ Heritage, Stuart (September 10, 2010). "Bill Murray is 60! Celebrate with 60 Bill Murray facts". The Guardian. Retrieved May 12, 2015. ^ a b Voynar, Kim (July 18, 2005). "New Releases: Charlie and the Chocolate Factory". Moviefone. Archived from the original on June 18, 2015. Retrieved June 18, 2015. ^ Baillie, Katie (February 13, 2015). "Here's what the kids from Charlie and the Chocolate look like 10 years on". Metro. Retrieved June 18, 2015. ^ Skipper, Ben (August 12, 2014). "The Nearly Roles Of Robin Williams: Joker, Hagrid, The Shining, Riddler". International Business Times. Retrieved June 18, 2015. ^ Romano, Nick (March 16, 2015). "THE LOST ROLES OF BRAD PITT: 10 MOVIES THE 'INGLOURIOUS BASTERD' ALMOST STARRED IN". Ifc.com. Retrieved June 18, 2015. ^ "LESLIE NIELSEN FACTS". ShortList. Archived from the original on July 9, 2015. Retrieved July 8, 2015. ^ Honeybone, Nigel (April 25, 2012). "Film Review: Willy Wonka And The Chocolate Factory (1971)". Retrieved July 8, 2015. ^ "Hoffman Missed Out On Wonka". Contactmusic.com. June 29, 2007. Retrieved July 8, 2015. ^ Zamer, Rebecca (July 25, 2014). "Dwayne Johnson: 7 Eyebrow Raising Facts". Entertainment Tonight. Retrieved June 19, 2015. ^ Staff (April 18, 2005). "Movie Preview: Charlie and the Chocolate Factory". Entertainment Weekly. Retrieved June 11, 2009. ^ a b Steve Head (July 13, 2005). "Interview: Johnny Depp". IGN. Archived from the original on December 4, 2010. Retrieved June 12, 2009. ^ Rebecca Winters (June 26, 2005). "Just a Couple of Eccentrics". Time. Retrieved June 12, 2009. ^ Freddie Highmore; Kristin Kloberdanz (November 29, 2004). "Q&A Freddie Highmore". Time. Retrieved June 12, 2009. ^ Steve Head (July 15, 2005). "Interview: Freddy Highmore". IGN. Retrieved July 12, 2009. ^ Board, Josh (May 12, 2011). "San Diego Acting Legend Gregory Peck Gets a Stamp". Retrieved June 15, 2015. ^ "Charlie and the Chocolate Factory". January 7, 2013. Retrieved July 13, 2015. ^ Paul Chai (September 27, 2004). "Sets and the city". Variety. Retrieved June 10, 2009. ^ Jamie Graham (May 2005). "2005 Summer Preview: Charlie and the Chocolate Factory". Total Film. ^ a b Michelle Kung (July 8, 2005). "I, Oompa-Loompa". Entertainment Weekly. Retrieved June 12, 2009. ^ "Charlie and the Chocolate Factory Blu-Ray review". TechnologyTell. January 30, 2012. Retrieved January 31, 2012. ^ a b c "Production Notes". Warner Bros. Archived from the original on August 1, 2009. Retrieved August 18, 2009. ^ a b c Rob Lowman (July 15, 2005). "DANNY ELFMAN GOES (CHOCOLATE-COVERED) NUTS". Los Angeles Daily News. Retrieved August 18, 2009. ^ Campbell Robertson (July 12, 2005). "Premieres to Avoid: Charlie and the Tripe Factory". The New York Times. ^ a b c "Charlie and the Chocolate Factory". Box Office Mojo. Retrieved June 11, 2009. ^ Tamsen Tillson (December 16, 2004). "'Wonka' pic blown up". Variety. Retrieved June 10, 2009. ^ Army Archerd (April 24, 2004). "Rowlands takes time from 'Key' to heal". Variety. Retrieved June 10, 2009. ^ Staff (July 10, 2005). "Children's Best Sellers: July 10, 2005". The New York Times. ^ Staff (October 23, 2005). "Children's Best Sellers: October 23, 2005". The New York Times. ^ a b "2005 Domestic Grosses". Box Office Mojo. Retrieved June 11, 2009. ^ "2005 Worldwide Grosses". Box Office Mojo. Retrieved June 11, 2009. ^ "Charlie and the Chocolate Factory (2005)". Rotten Tomatoes. Retrieved March 30, 2019. ^ "Charlie and the Chocolate Factory (2005): Reviews". Metacritic. Retrieved June 11, 2009. ^ Owen Gleiberman (July 13, 2005). "Charlie and the Chocolate Factory". Entertainment Weekly. Retrieved July 25, 2009. ^ Ebert, Roger. "Charlie and the Chocolate Factory". Chicago Sun-Times. ^ Mick LaSalle (July 15, 2005). "Depp brings a nutty center to Willy Wonka adventure". San Francisco Chronicle. Retrieved July 25, 2009. ^ Peter Travers (July 14, 2005). "Charlie and the Chocolate Factory". Rolling Stone. Archived from the original on June 20, 2008. Retrieved July 25, 2009. ^ Ann Hornaday (July 15, 2005). "Sorry, Charlie". The Washington Post. Retrieved July 25, 2009. ^ Manouse, Ernie (December 16, 2007). Gene Wilder on InnerVIEWS with Ernie Manouse. Event occurs at 20:50. ^ Suskind, Alex (June 14, 2013). "Gene Wilder on Today's 'Dirty' Movies and Why 'Charlie and the Chocolate Factory' Is 'an Insult'". Moviefone. Archived from the original on June 17, 2013. Retrieved July 11, 2015. ^ "Charlie and the Chocolate Factory". British Academy of Film and Television Arts. Retrieved July 25, 2009. ^ "Past Saturn Awards". Academy of Science Fiction, Fantasy & Horror Films. Archived from the original on May 12, 2011. Retrieved July 25, 2009. ^ Edwin Page (2007). "Charlie and the Chocolate Factory". Gothic Fantasy: The Films of Tim Burton. London: Marion Boyars Publishers. pp. 210–224. ISBN 0-7145-3132-4.